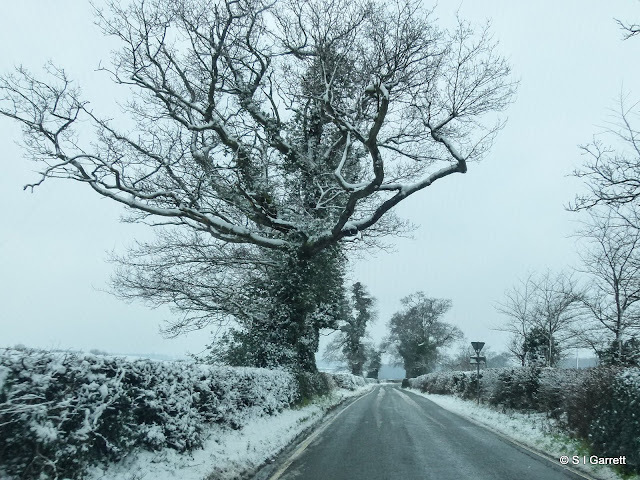 Last week we had planned an escape into the country but on Friday when we woke it seemed debatable whether or not we would actually leave home. Overnight snow made us ponder the wisdom of setting out and to review our options. Our plan was to travel to Abbots Morton a small village near Stratford in Worcestershire. It was only just over a couple of hours journey so we didn't need to set off until after lunch giving Martyn time to check our route on the Internet (wonderful things motorway cameras!) After being fairly certain that we would arrive safely, soon after lunch we set off. In the event when we arrived at our destination there was no snow at all - that waited until we arrived as Saturday morning we woke up to this view from our bathroom window. Fortunately the country roads were clear and so we could stock up at a nearby farm shop. 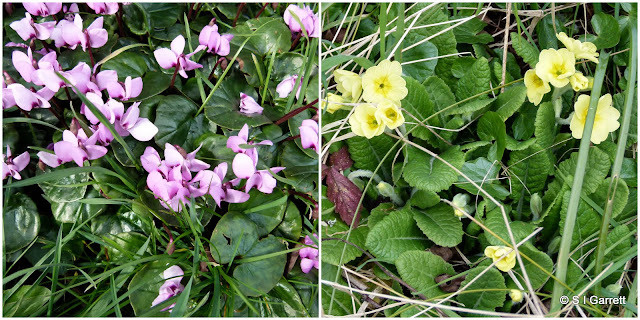 So it was back to our rented cottage and a walk in the biting cold around the village where we spotted these brave little plants flowering in the grass verges. 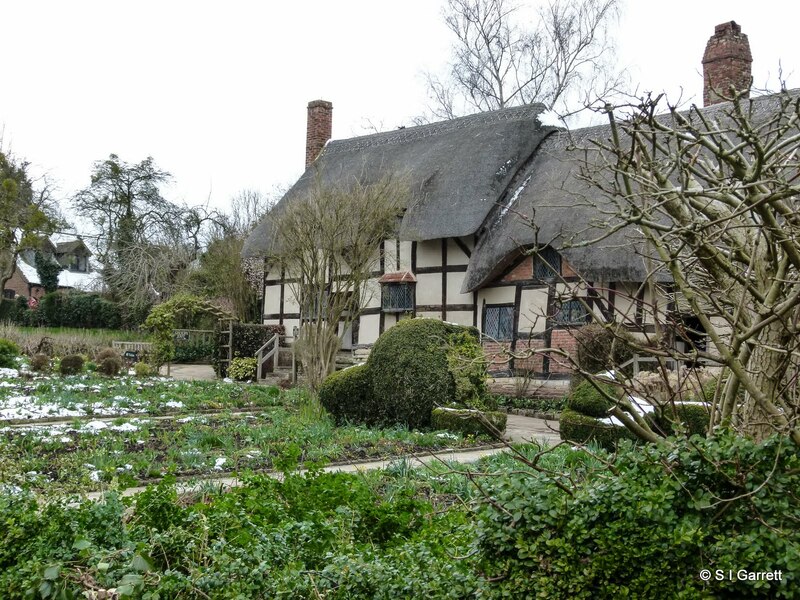 Tuesday we headed for for Stratford to Anne Hathaway's Cottage where I managed a quick photo from over the hedge - we couldn't go into the garden as dog's weren't allowed. Back to the village for another walk but this time it was so cold that the dog was reluctant to come with us. We left her in the warm whilst we ventured out - in fairness we had several layers of clothing to try to keep us a bit warmer. The cottage where we stayed was once a post office but all that remains to hint at its past life is a post box set into the wall. See Martyn's blog here for a different photo. 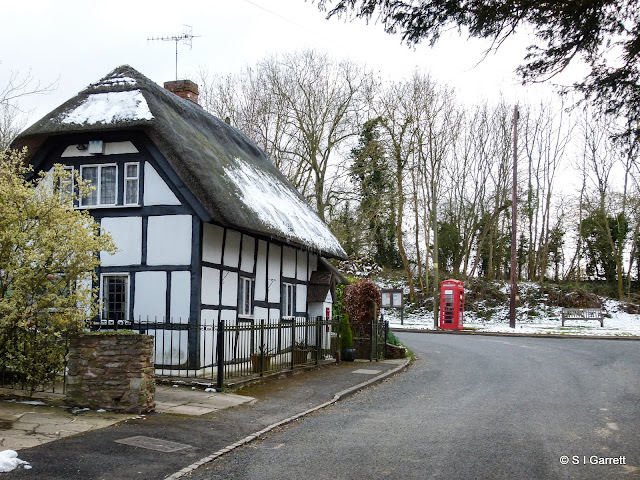 The cottage is a grade II listed building and hit the headlines in 1981 when the post office cat saw off a couple of would-be robbers! Good job our dog didn't know that or she could have had nightmares! 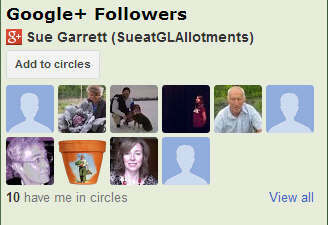 I tried to put a Followers gadget on Martyn's Steam Days blog but it was missing from the list of options. In trying find out what had happened I found some information on the Google Help Centre which stated that the Followers gadget is going to be 'retired'. It doesn't say when and this is the first I've heard about it. So this gadget on my blog sidebar will presumably disappear at some stage along with all of you who have so kindly added yourself to the list. This gadget is being replaced by a Google+ Followers gadget like this which I have added to the sidebar of my blog so if you like you can swap. If you look on the sidebar you can follow my blog using various other alternative methods such as Facebook, Twitter, email or Bloglovin. Apparently Google Reader is being retired too. 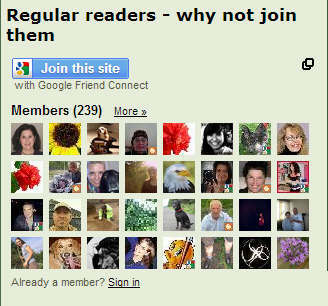 Blogger is obviously putting all its eggs into the Google+ basket. 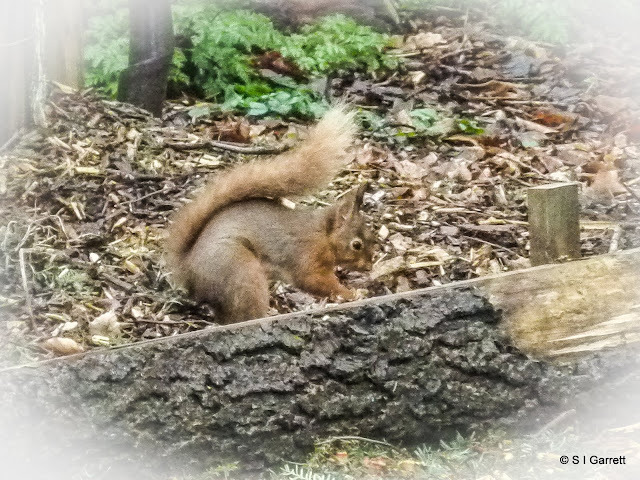 It is so frustrating when they decide to scrap something that is working but I do hope this won't stop you following my blog as I would miss knowing you were there! Tickling brush at the ready. At this time of year we watch with eager anticipation for the first flower buds to appear on our fruit trees. 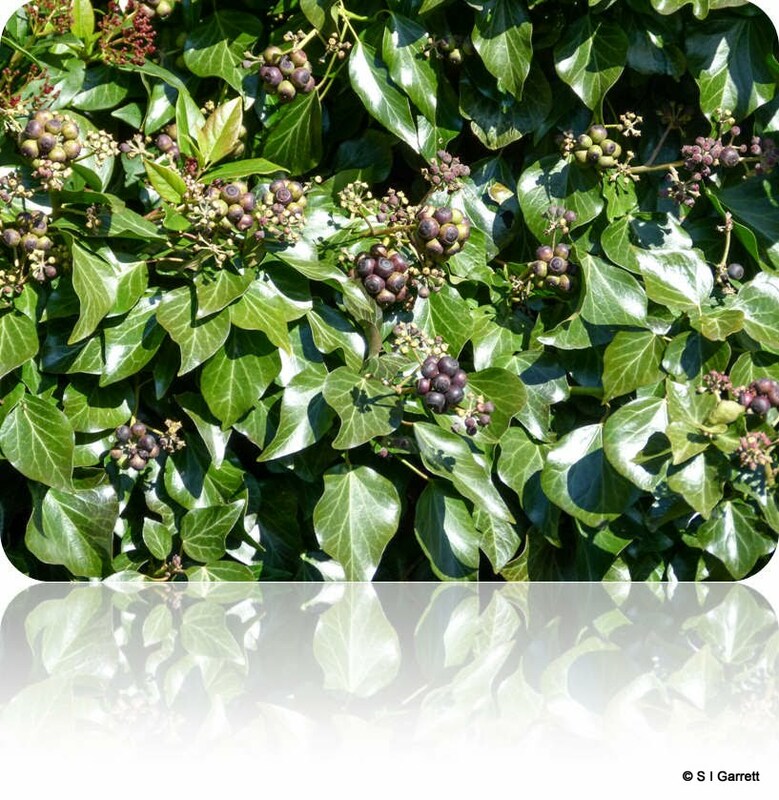 Although we have a lot of fruit trees on the plot, we have also gradually built up a collection in the garden. These are mainly ones that we feel need a little more attention - peach, nectarine, apricot and a cherry. They are grown on dwarfing root stocks and planted in large pots to try and restrict their ultimate size. 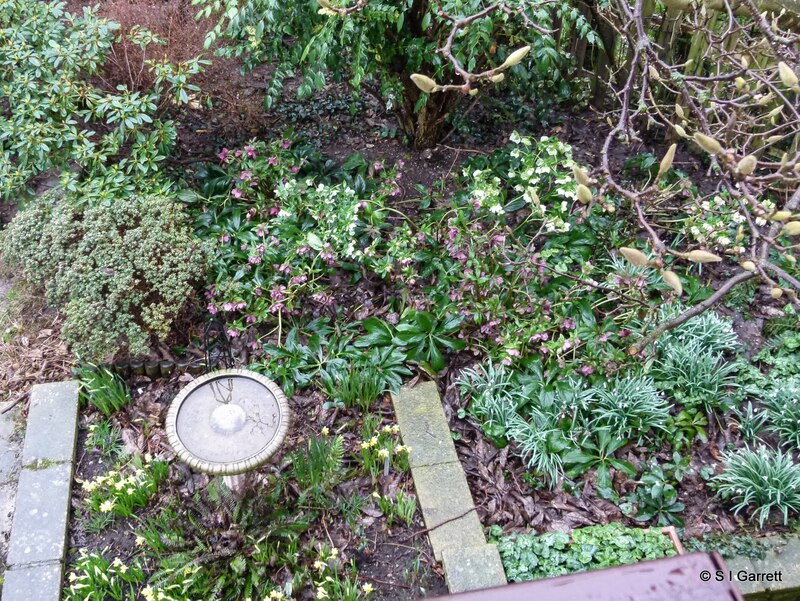 Our garden is also more sheltered than the plot which they will appreciate. The peach tree is the most mature. You may remember this was an accidental purchase - it should have been a nectarine but the company sent out the wrong tree. It turned out to be a happy accident and has provided us with a few fruits for the last two years. 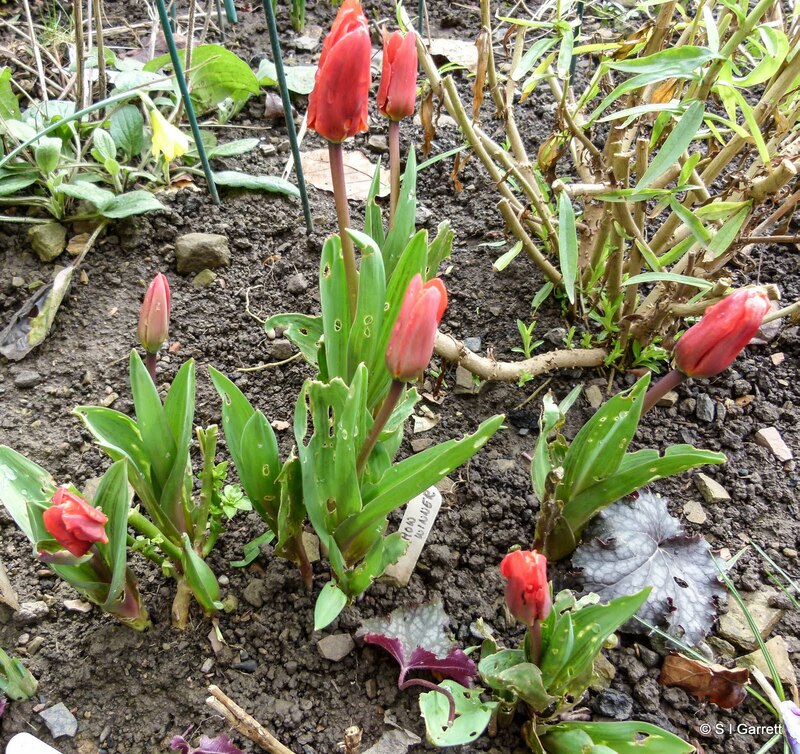 This time of year we keep checking eagerly anticipating the first buds. 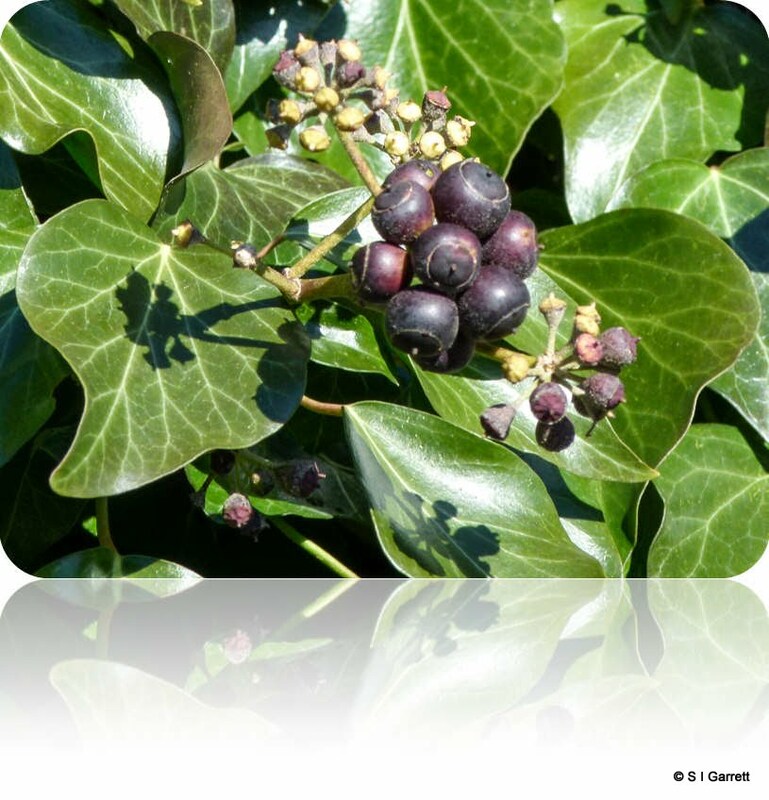 All of these trees produce flowers before leaves so any buds swelling are likely to be potential flowers. The trees other than the peach were only planted last year and have yet to produce any pickings. 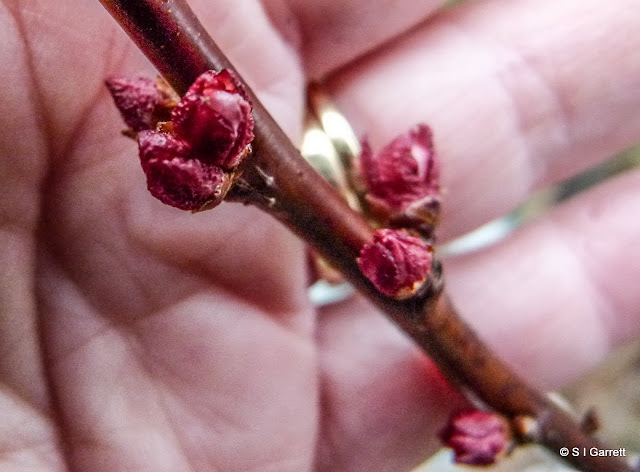 I'm hoping that this year we may get at least a tasting so I was particularly pleased to see that the apricot - Flavourcot - is beginning to produce buds. 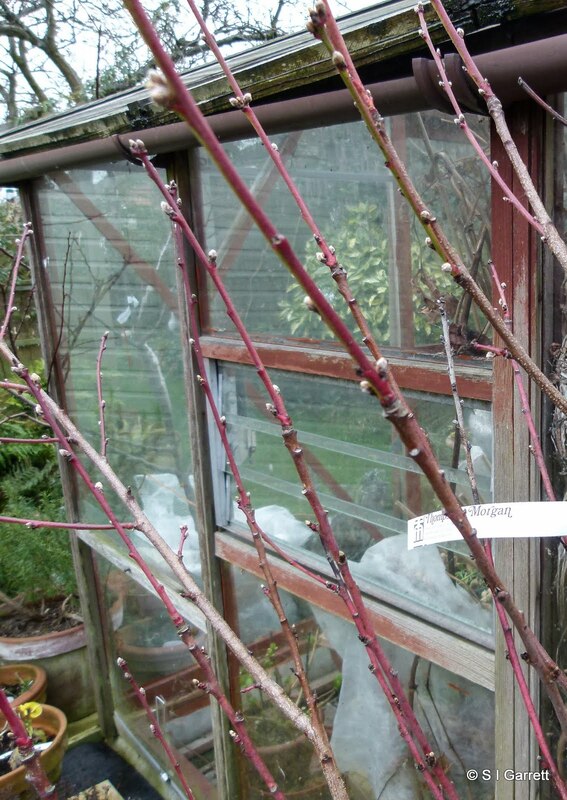 The peach - Fantasia, although not quite as advanced as the apricot also has buds starting to develop. Once the flowers open (how's that for optimism) we will drape some fleece over the branches whenever frost threatens and I'll have my tickling brush ready just in case the pollinating insects are still in bed! If we get any fruit you'll be amongst the first to know! What I call the bird bath bed is situated close to the area where the hellebores and snowdrops are planted. If you look closely you can just see them in the background. This photo taken by hanging outside an upstairs window (what lengths I go to just to get photos for this blog) gives a better idea of the relative position. 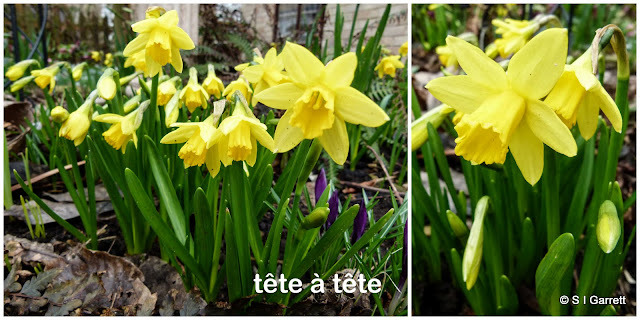 The bed is close to a downstairs house window and so it is another area where in spring the focus is the colour provided by bulbs. 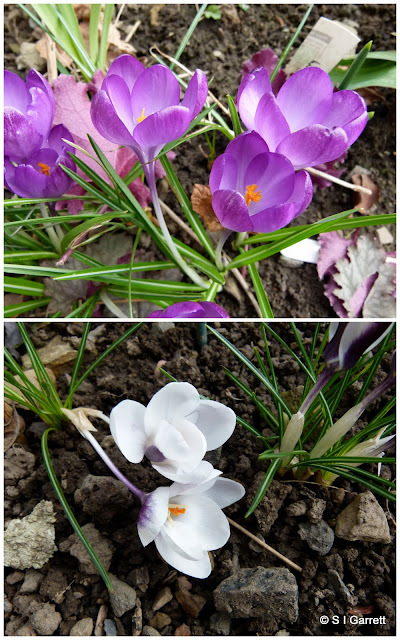 By now I would have expected the crocuses to be fully open, some of the dwarf tulips to be flowering and to have a display of various dwarf narcissi but at the moment this year only the tête à tête are making an effort. 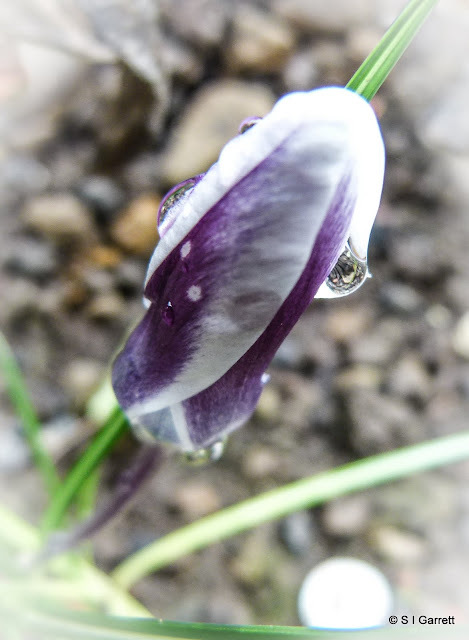 Maybe the wet conditions combined with additional watering from splashing birds has been just too much for some bulbs. 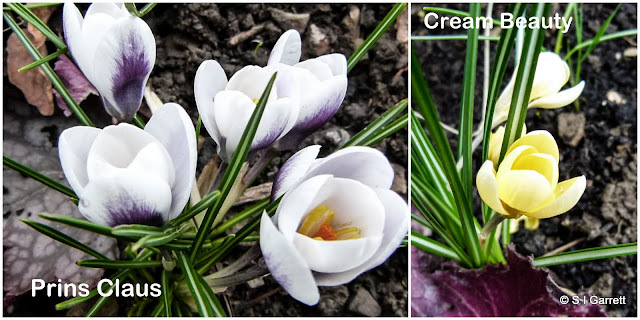 I'm not sure that we will see much of the crocuses but maybe with a bit of encouragement from the sun the other bulbs may decide to show their faces. 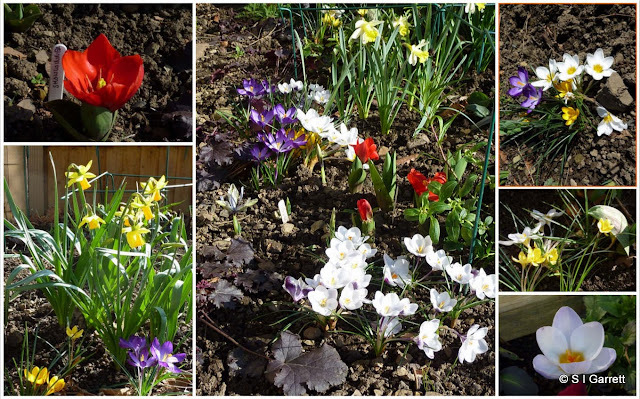 I made the most of a brief spell of dry bright weather on Tuesday morning to do a bit of work on the front garden bed. 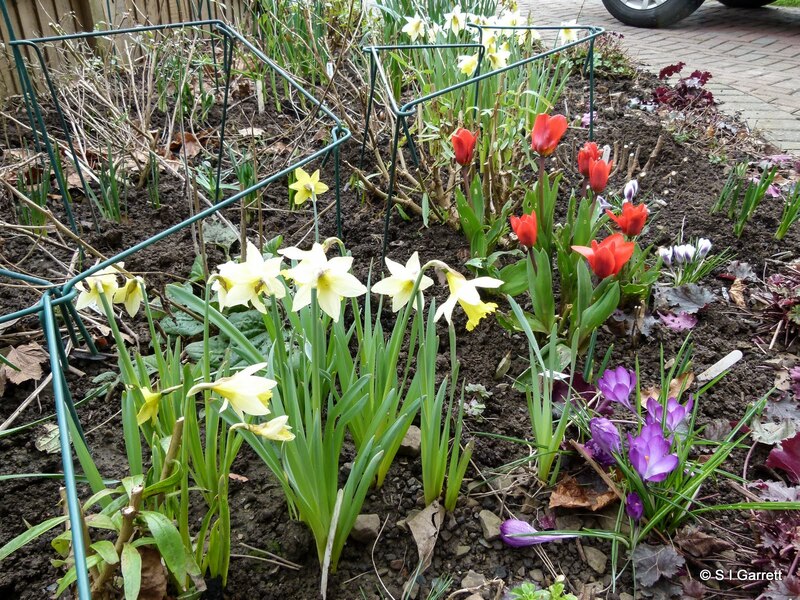 At this time of year I want spring bulbs to be the focus of this bed and, as I mentioned in a previous post, last year I bought some extra bulbs to add to this bed but had planted them in pots to put in gaps when the existing bulbs had made their presence known. Most of the bulbs have come through now so I could find gaps in which to plant my 'new' bulbs. 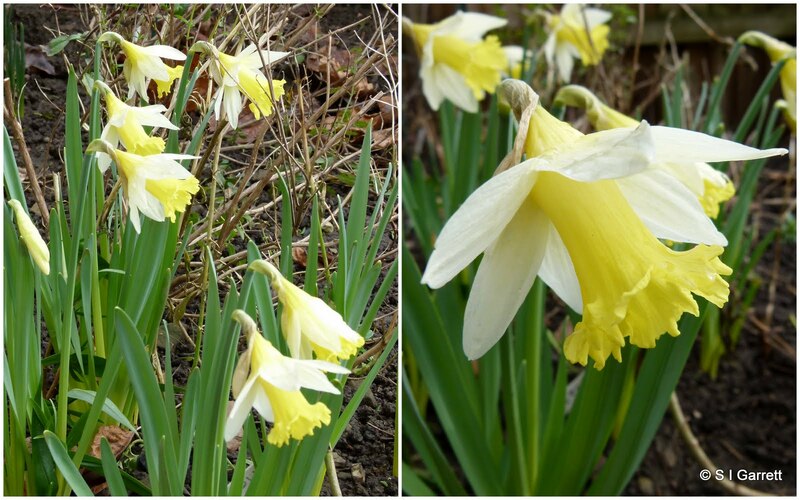 I had three types of bulb to plant, two types of narcissus - Dickcissel and Minnow and some mixed Dutch irises. I can't show you photos of the new bulbs yet as they are not yet flowering but below are bulbs that are flowering at the moment. 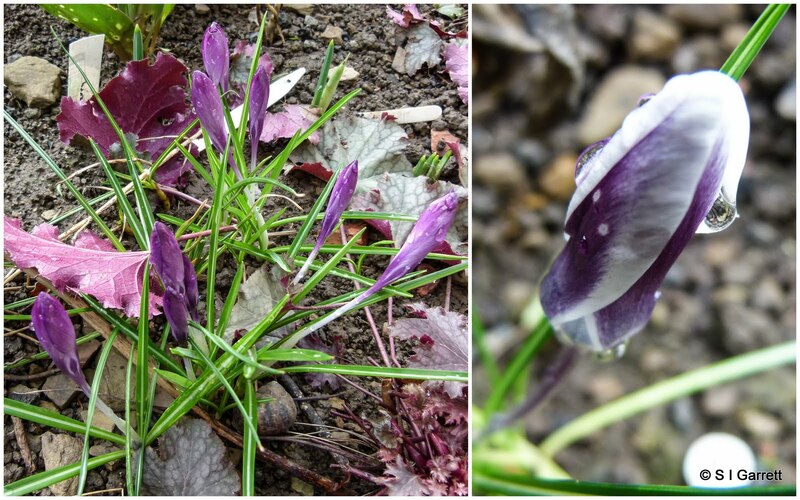 The soil was still very claggy and wet but I did manage to loosen it a little and the perennials that I cut back earlier are beginning to produce new growth. To quote the postman who commented as he delivered our post - things just need a little sunshine to bring them on! Last year a friend bought us a potted hydrangea as a summerhouse warming present. The plant has spent winter in the garden greenhouse and is now beginning to produce new green shoots. 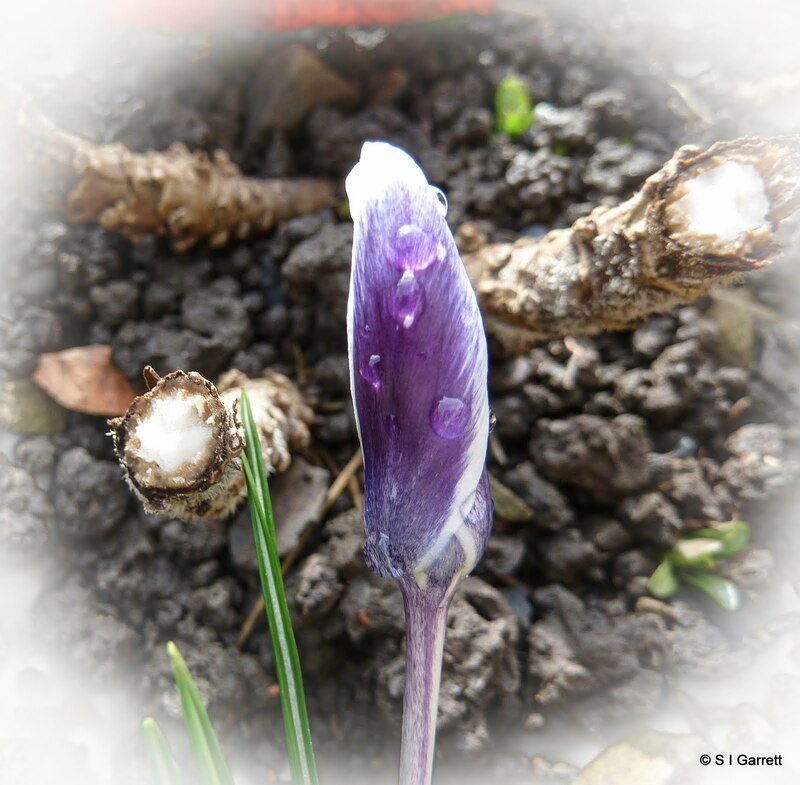 This was a signal for me to cut off the dead 'flower' heads which had been left on to give a little frost protection. It's still in the greenhouse so hopefully now the shoots will survive. I wonder whether it will flower again for us this year. 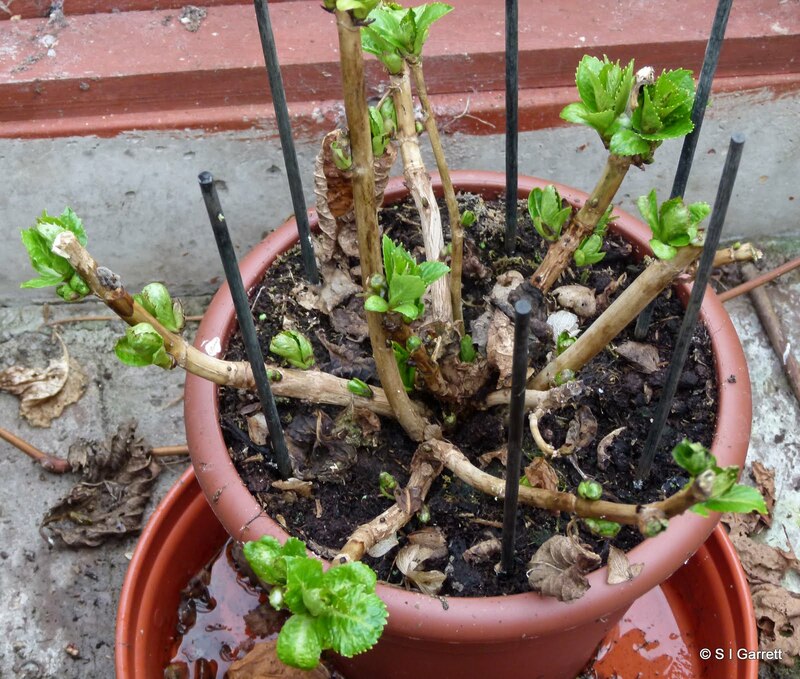 Anyone grown a hydrangea in a pot and had it flower again successfully? Yellow the colour of spring? 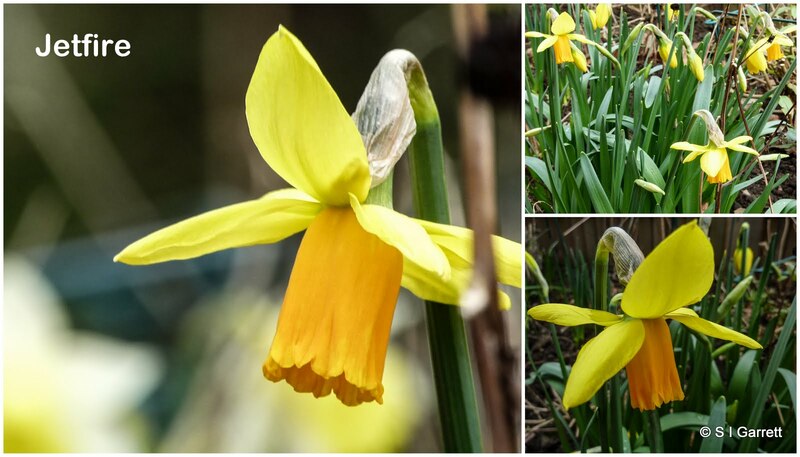 If someone was to ask me which colour epitomised spring I would choose yellow. I always think spring has truly arrived when the garden has splashes of yellow appearing amidst a fresh, exuberant, green background. It's the sort of green that nature just doesn't repeat at any other time of the year. Maybe I ought to qualify my choice of spring colour and say yellow and green. When I was teaching I always used these two colours to line the walls for my classroom displays at this time of year - there were no other colours that could compete. 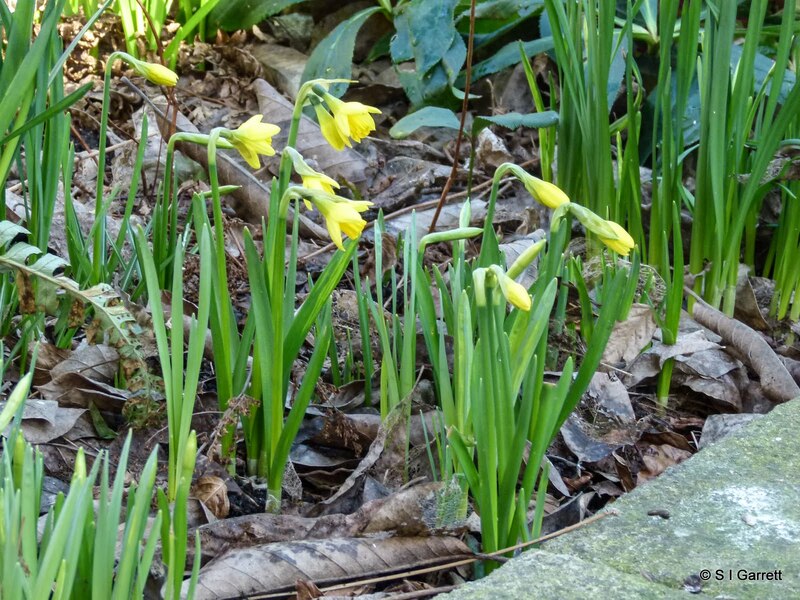 In our garden the miniature daffodils tête à tête are just beginning to add the first smatterings of yellow into the back garden. Going back through my photos from last year, I think these flowers are just over two weeks behind this year. 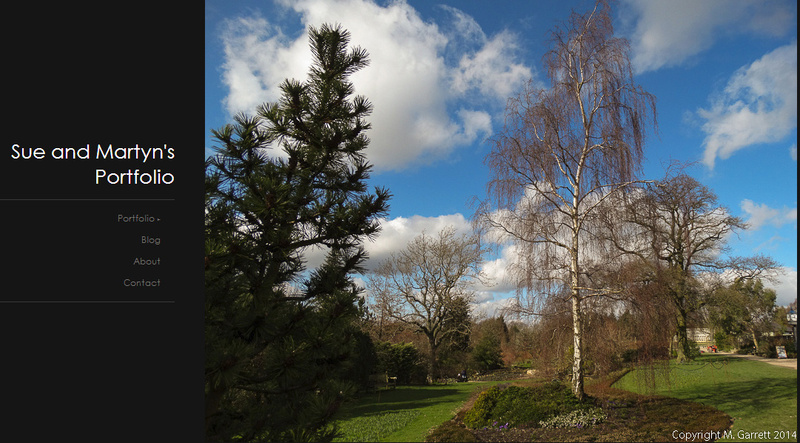 Let's hope that spring hurries up and takes the hint. So which colour would you choose as the herald of spring? 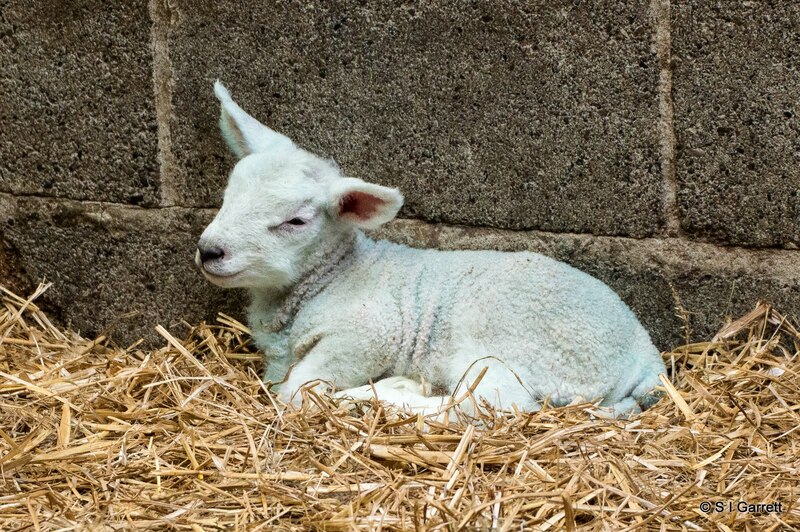 You need a woolly jumper in this weather! 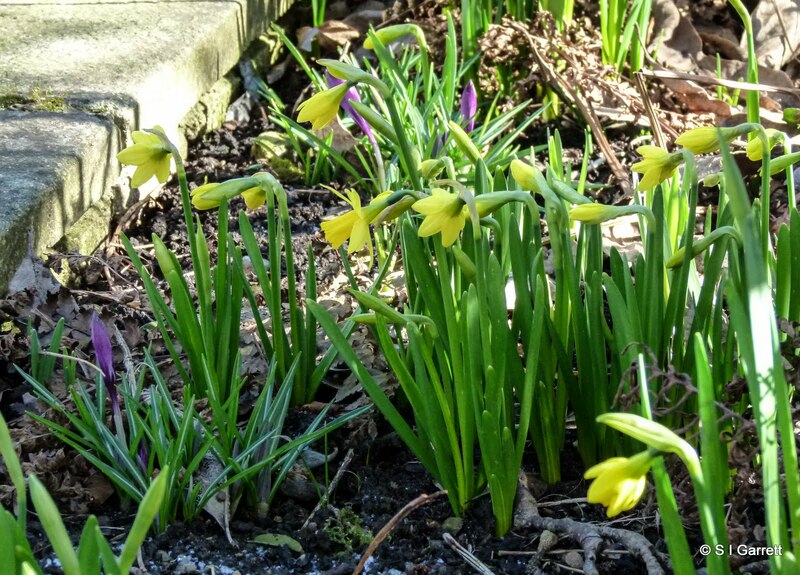 The weather can't stop some spring events from happening. 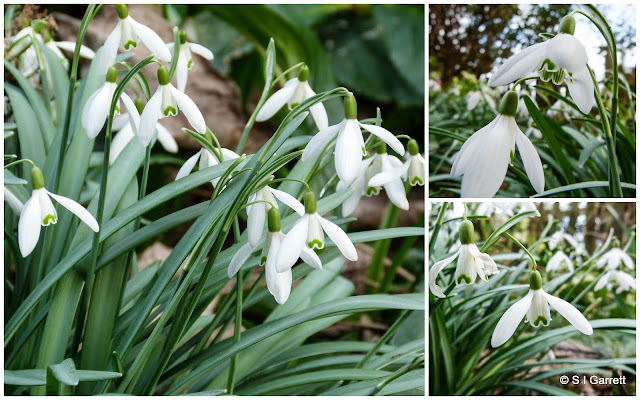 These photos were taken at Mainsgill Farm in North Yorkshire where we stopped off for a coffee during a day out on Saturday. Not only are visitors allowed to view the activities in the lambing shed but you can also view their live web cam video online. 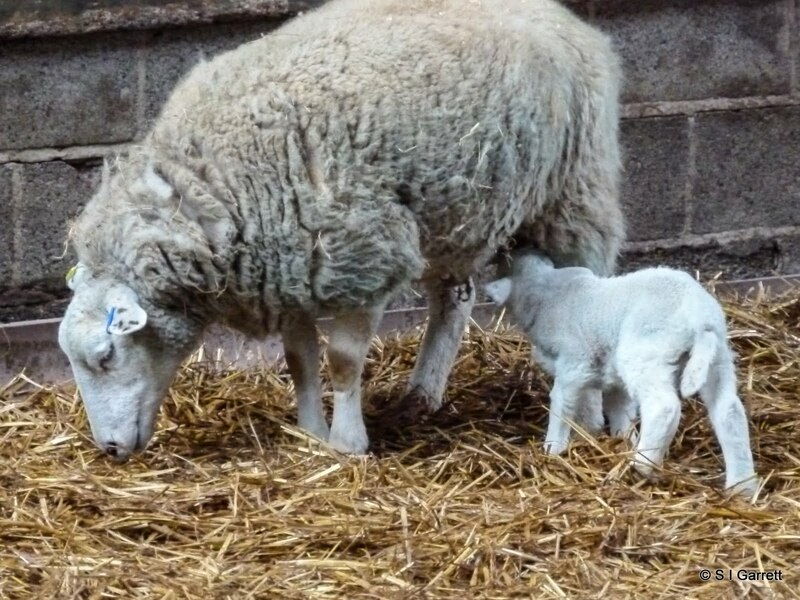 The young lambs looked as though they were wearing jumpers that we too large for them! Martyn posted a short video here. 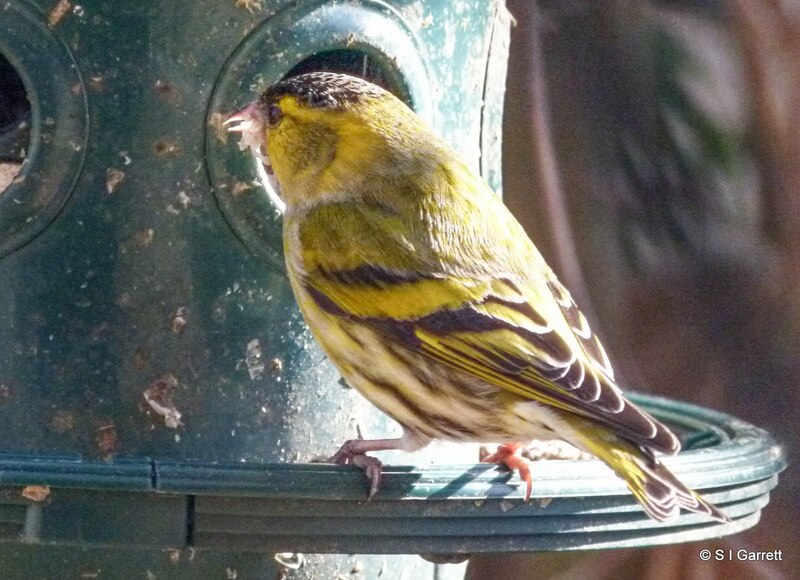 During the winter of 2011 in February we were regularly visited by four siskins - two males and two females. 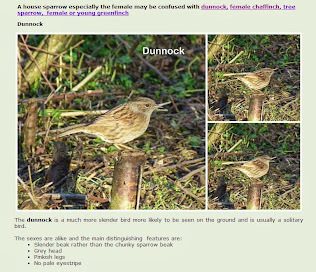 As it was the first time we had seen these birds they scored a 10 on our birds seen in the garden scale. 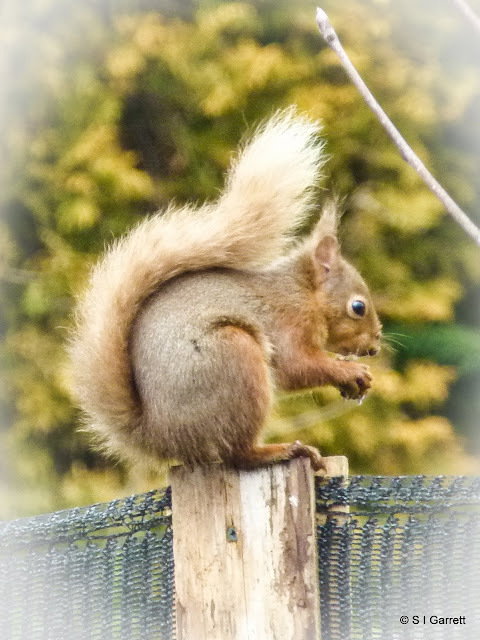 Since then we have been hoping that they would pay us another visit - last year no sign of them and then this year at the beginning of February we had a brief glimpse of two males as they paid an all too fleeting visit to have a very quick snack from our sunflower hearts feeder. We were lucky to see them at all and didn't have chance to take any sort of photo - in fact it made us wonder how many times we may have missed such a visit just because we didn't happen to be looking out of the window at the right time. 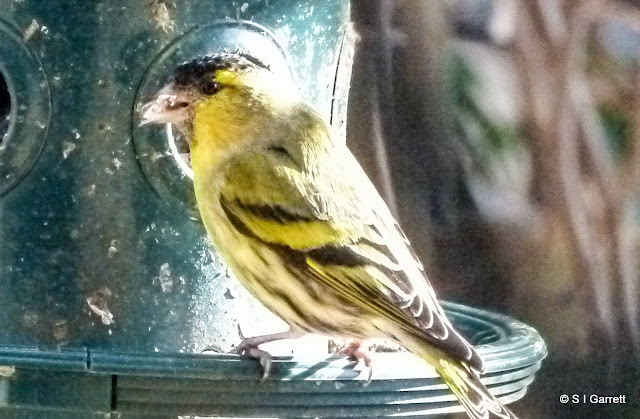 Then the other I noticed that a greenfinch was on the feeder and the sun was just catching his feathers in a way that showed off his bright colours so I grabbed my camera. 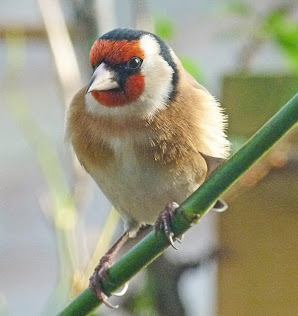 Not quickly enough as one of the possessive goldfinches sent him on his way. Optimistically, camera in hand I waited for his return. A bright green bird landed. As I focused the camera I realised that this wasn't a returning greenfinch but a male siskin. 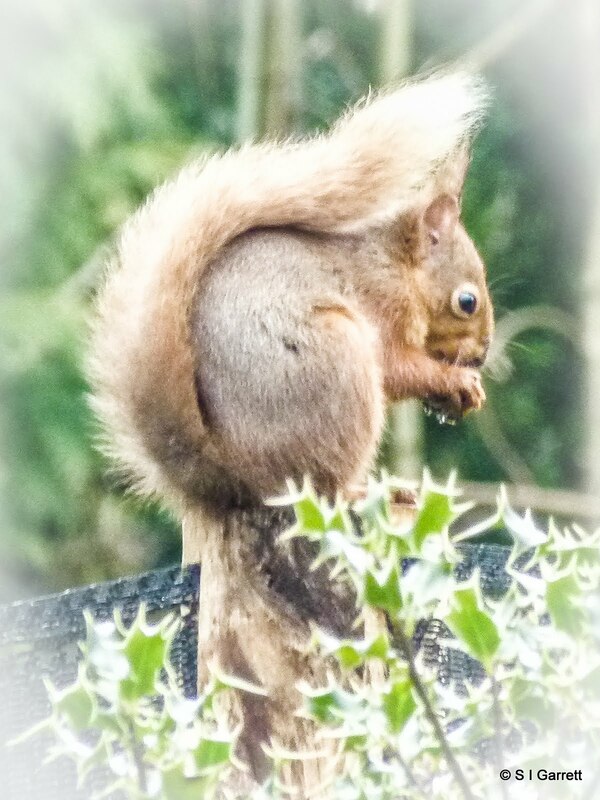 This time I had the camera ready but I daren't get too close to the window and so the focus isn't as crisp as I would like but anyway here he is. 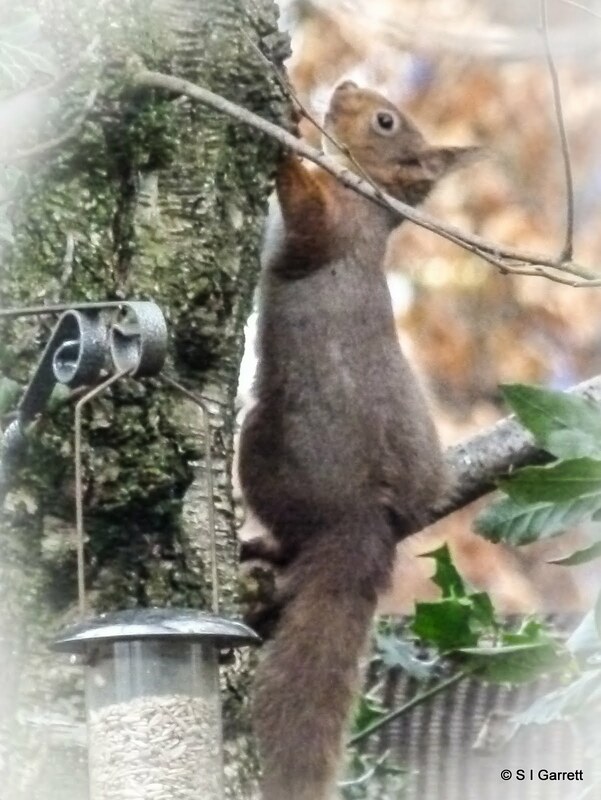 He didn't stay long - I wonder how many times he has make a sneaky visit. He seems to agree with the goldfinches that sunflower hearts are a tasty treat. We don't appear to have had any female visitors. It seems that late winter is the most common time to see siskins in the garden as their natural food supply is becoming more scarce and they haven't yet gone off to their breeding areas. I hope our males find an attractive female soon. This is getting silly isn't it? 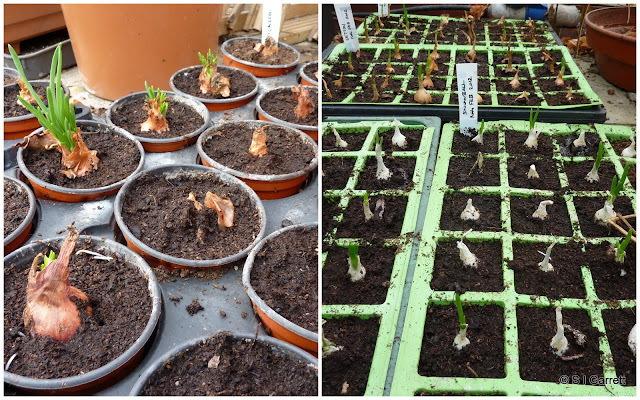 You may remember in an earlier post I mentioned planting some of our onion and shallot sets in modules in the greenhouse. I think I'm becoming slightly obsessed with looking back at what was happening this time last year. The onion and shallots pictured below were planted in modules on 18 February. A few had started to shoot in the net bags that they had been delivered in so I thought they were raring to grow. 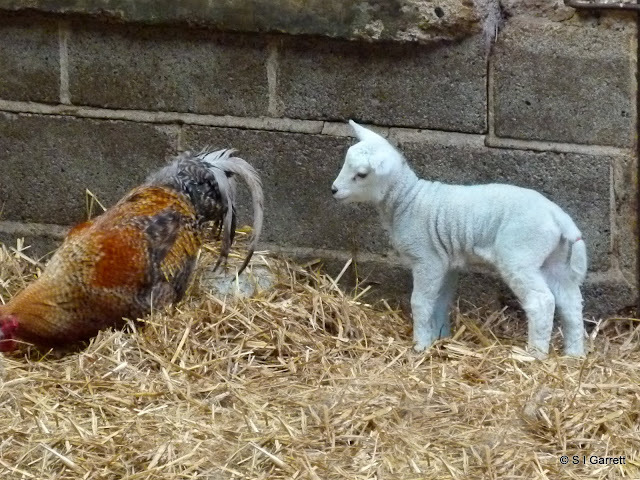 Maybe they were until they realised that in the real world conditions were not so cosy! 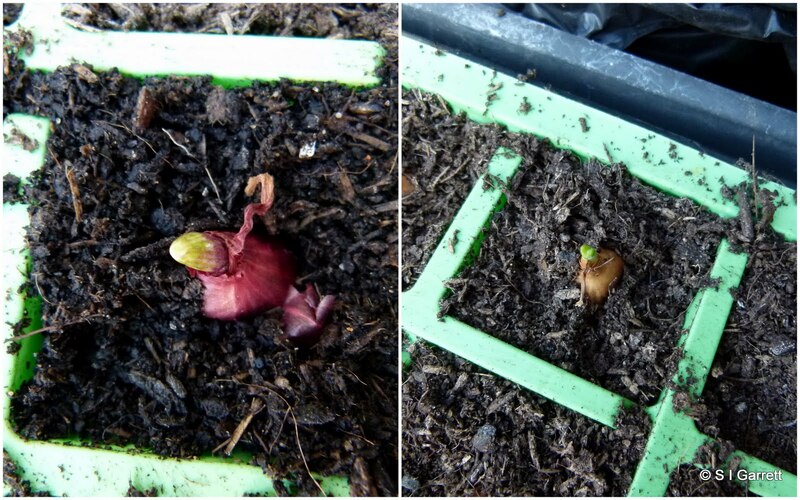 So far the shallot shoots have refused to venture out of the bulb and a small number of onions are only just showing their noses. 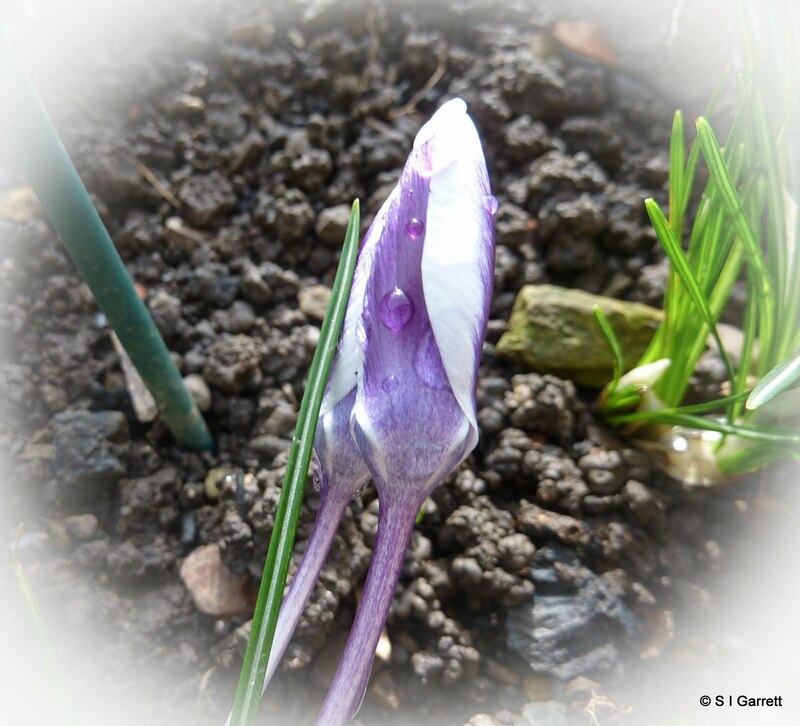 Last year I took this photo which showed the onions and shallots were off to a good start. It was a pity things didn't continue on a positive note. In April after they were planted out conditions were poor and they never really recovered from the setback. I had hoped that the second lot of onion sets would be planted directly on the plot but conditions being as they are I decided to plant a second lot in modules. I planted another tray of each of the four varieties Karmen, Stuttgarter, Rumba and Sturon. To be honest if I hadn't planted them I wouldn't really be able to tell which of the trays of onions had been planted first. I just hope they all soon decide to get a move on. 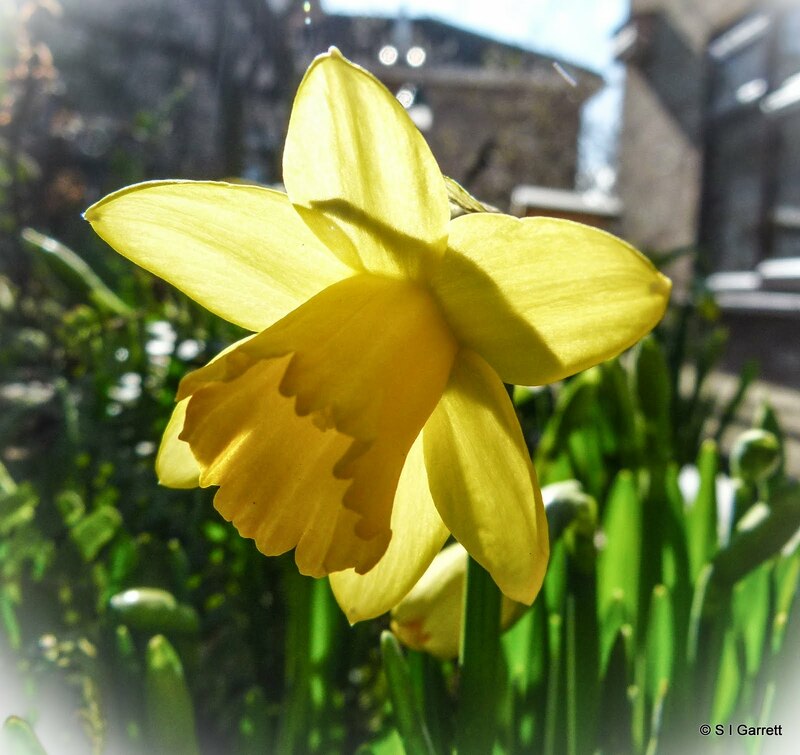 Let's just hope that this year we will experience the opposite to last year and once March is out of the way, April will arrive with warmth and sunshine which will continue through summer. 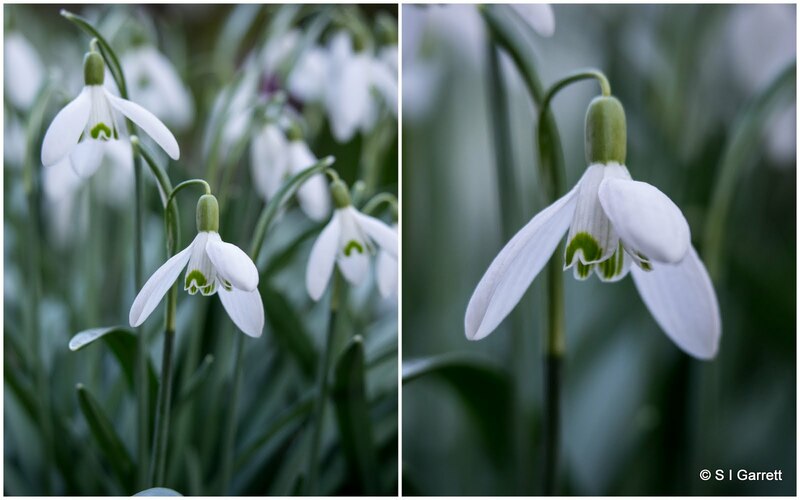 This week I have been bemoaning the fact that the snowdrops and crocuses are just not opening up their petals and so I was delighted yesterday that the brief periods of brightness (I refuse to call it sunshine) encouraged the petals to unfurl. For the snowdrops it may be a last chance to strut their stuff as the flowers are fading and the seed capsules are just beginning to swell. As for the crocus Prince Claus (Prins Claus) can't even manage to stand upright to put on a show and is lying down on the job whereas the purple ones (from a mixed pack so I don't know which variety it is but they look like yours Bilbo) are made of sterner stuff. 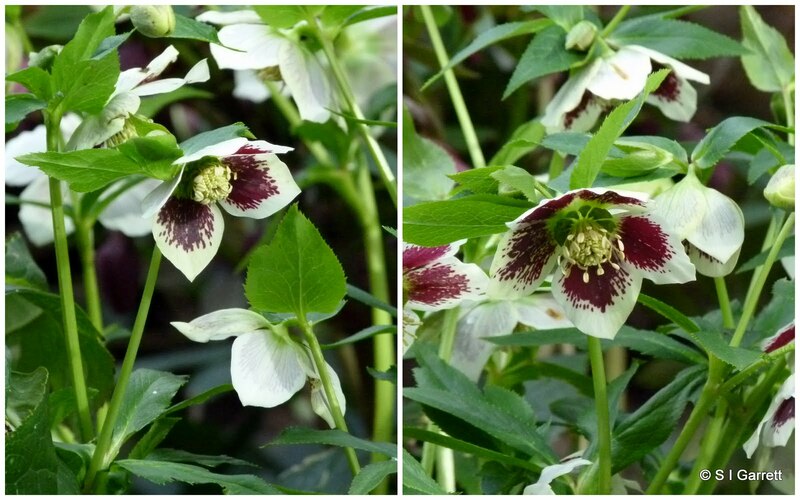 The hellebores have been worth their place in the garden this year, they have hung on in through the poor weather and flowered their hearts out. 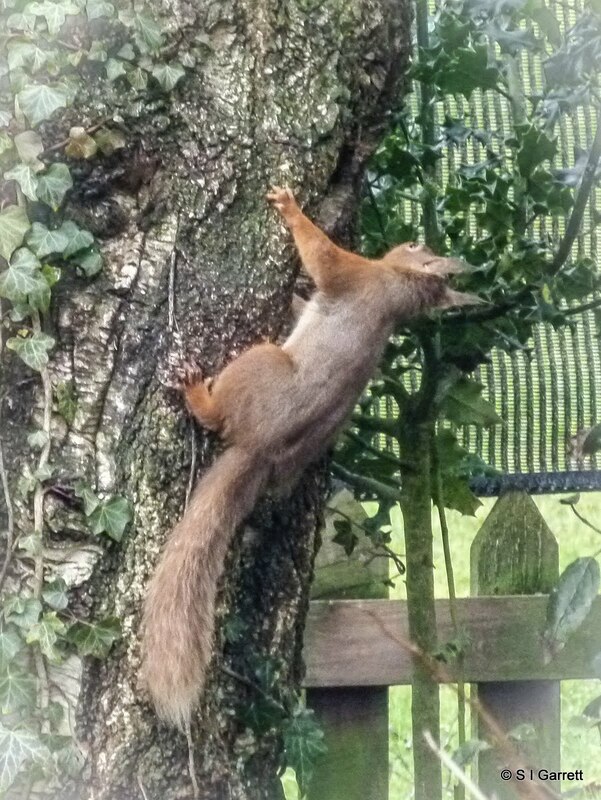 Even now they are putting on quite a display. They don't seem to be dependent on the sunshine in order for the flowers to open. 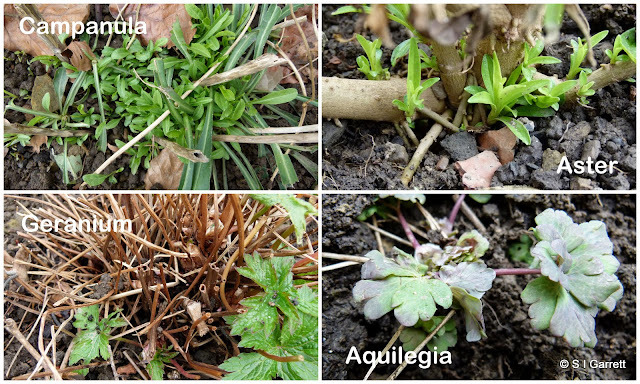 Other plants have sulked in the dull conditions. 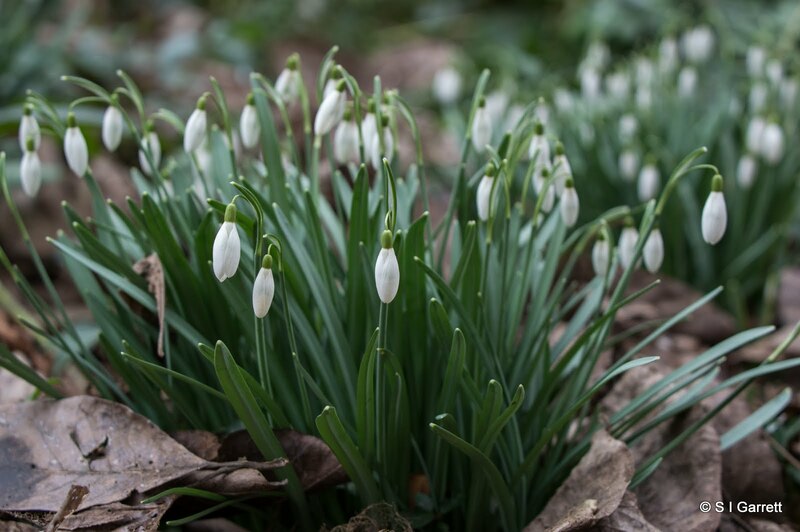 Although the snowdrops have had masses of buds we haven't really had the display that they usually provide with flowers buds for the most part remaining resolutely shut. In the brief bursts of sunshine we have rushed out - camera in hand to capture that brief moment of glory! The photo was taken after I had cut back all the perennials so that the bulbs had room to breathe. 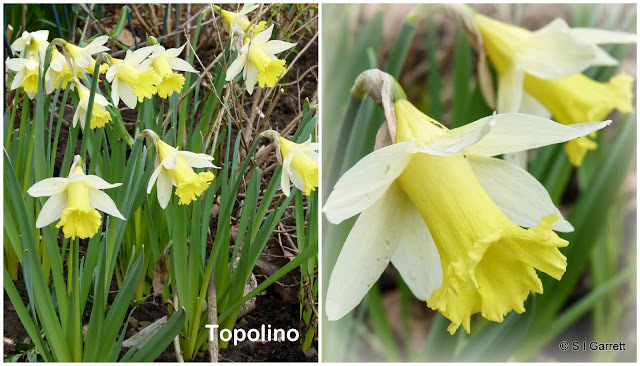 A couple of clumps of miniature daffodils - Topolino are bravely strutting their stuff. 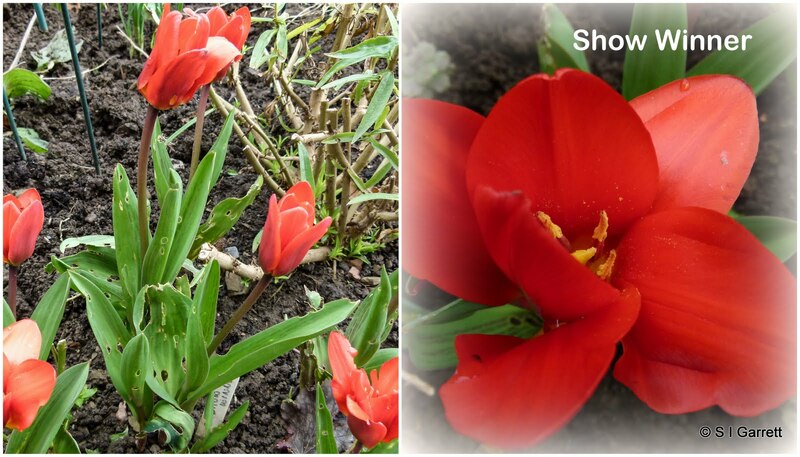 A clump of red mini tulips - Show Winner are also trying their best in spite of having rather ragged leaves. 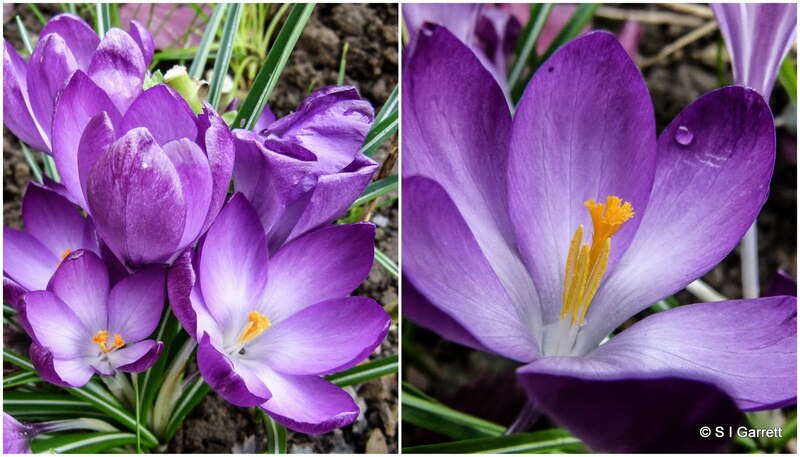 The crocuses are really struggling to open having almost permanently sodden petals. 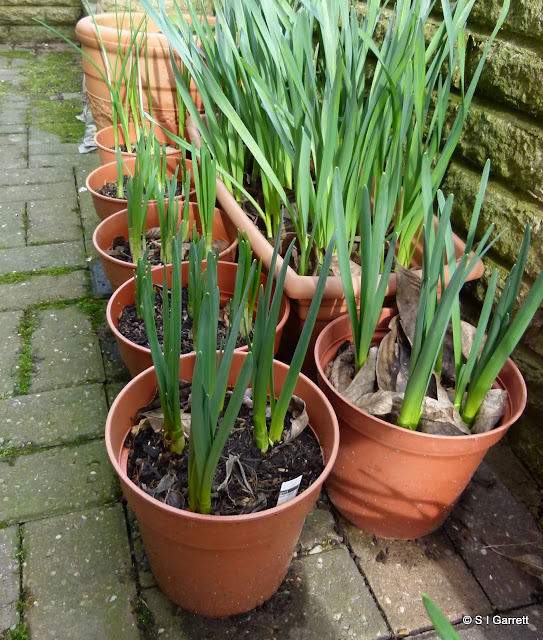 I planted some miniature daffodils and irises in pots at the end of last year with the intention of planting these out in the front bed to fill in some gaps. I wanted to wait until the existing bulbs were through so that I didn't inadvertently dig these up when trying to plant the new bulbs. As yet though I don't really want to stand on the wet soil so for the time being they are still waiting in their pots. 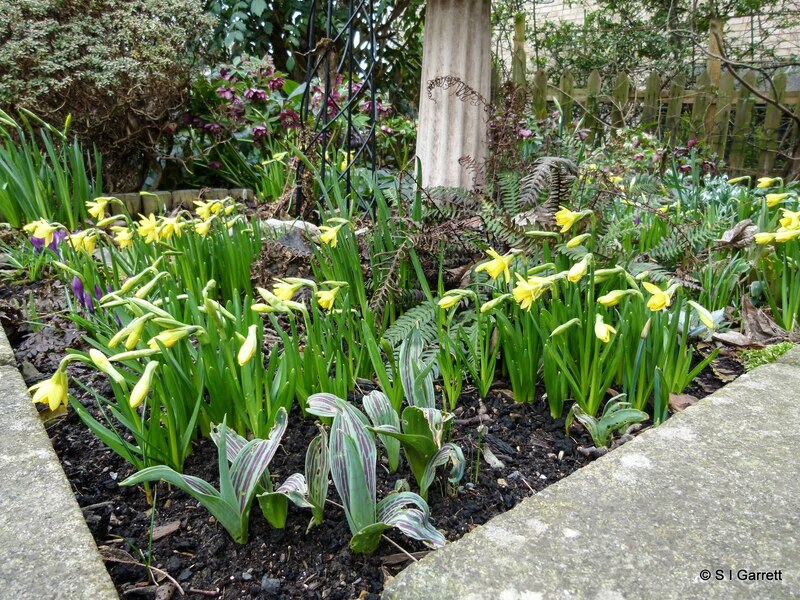 The trough at the back houses full size daffodils which are eventually intended for the plot. Just a lot of rhubarb.